S I G N & D I G I T A L G R A P H I C S • June 2018 • 67 S how, don't tell. Writers often swear by that dictum. Readers need to feel like they're experiencing a story, rather than being told a story, the thinking goes. Give family and friends experiences, not presents. You hear that a lot during the holidays. The idea is that we all have so many objects that ultimately get dis- carded or relegated to a corner of your home. Better to spend money on a vaca- tion you'll remember forever. Don't sell customers things; give them a shopping experience. Business consultants and influencers frequently invoke that, arguing that consumers can purchase things from anyone. But if they have an emotional connection with your brand, and they enjoy the experience of shopping at your business, they'll keep coming back. Larry Oberly is the CEO of SpeedPro Imaging. All of this explains why, more and more, signs and graphics are being tasked to create an experience. Signs, which have always been about telling the pub- lic information, are also becoming part of the show. 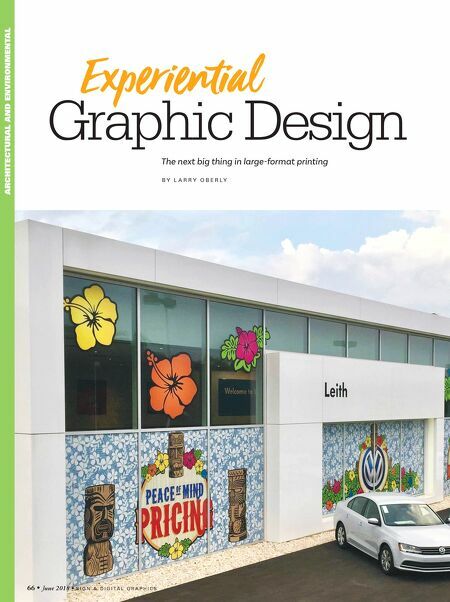 It's a trend that has been dubbed experiential graphic design, or EGD. And while it's the next big thing, it's hard to imagine it being a passing fad. When done right, EGD has been beyond suc- cessful, improving both the consumer experience and the bottom line for busi- nesses nationwide. You know what they say. Once is a fluke, twice is a coincidence and three times is a trend. 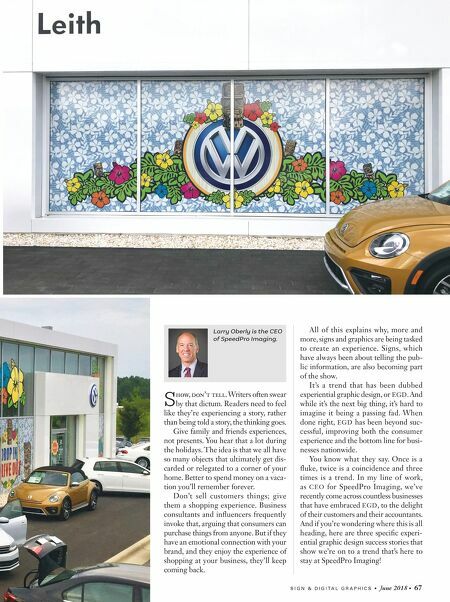 In my line of work, as CEO for SpeedPro Imaging, we've recently come across countless businesses that have embraced EGD, to the delight of their customers and their accountants. And if you're wondering where this is all heading, here are three specific experi- ential graphic design success stories that show we're on to a trend that's here to stay at SpeedPro Imaging!